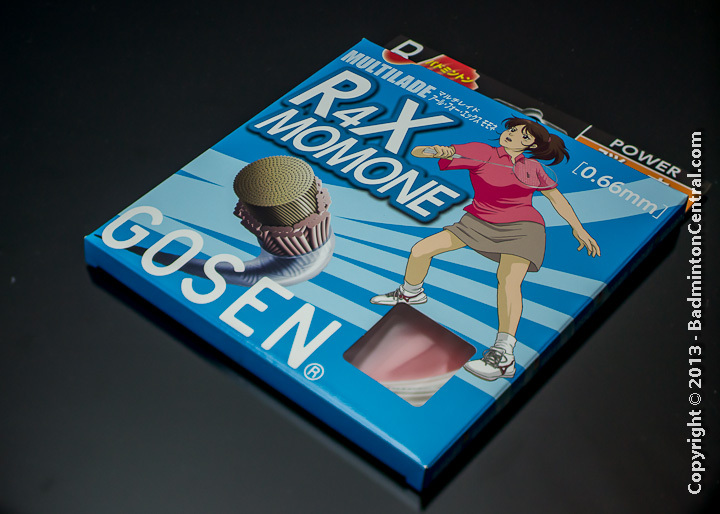 Last week I received a box of goodies from Adidas Badminton to review. Among them is a Adidas adizero pro racket. Adidas is a newcomer to the badminton equipment scene. 2+ years in the planning Adidas is finally ready to reveal their badminton lineup to the world. The Adidas adizero series of badminton racket is characterized by their fast swing speed, light 4U weight well suited for players who love a fast doubles games. There are 2 models in the adizero series that is designated as “advanced pro” models, basically these are the cream of the crop of the adizero series and have the most technology and advanced materials behind them. 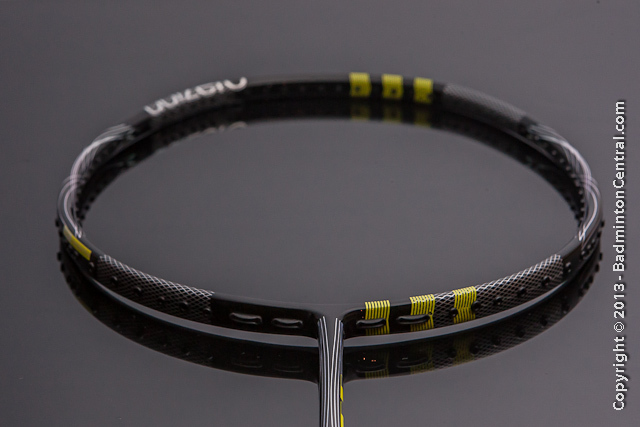 The adizero pro is rated as a medium stiffness singles/doubles racket for fast attacking player. The spec weight is 80g +/- 2g with a balance point of 295mm +/- 3mm. The shaft tapers from 7.5mm near the cone to 6.5mm near the T-joint. While the balance is a highish 295mm, the light overall weight of the racket give it a very fast swingweight. Like the head heavy adipower series, Adidas incorporated some unique technology for the adizero pro’s racket head. A “Dual Force Frame” consist of both titanium mesh at the 4 corners and Zylon fibers to reinforce the frame structure. Zylon is a material made by Toyobo company in Japan and is supposed to be 1.6 times stronger than Kevlar. More Zylon is strategically placed around the frame as part of the adizero pro’s “Vibration Control System”. The adizero pro also utilizes Adidas’ unique 78 holes stringing pattern. The 78 holes pattern is similar to the popular 76 holes pattern plus an extra pair of shared holes in the 4/8 o’clock positions. This makes it much easier for the stringer, as well as letting the engineers align the outermost main string to be completely parallel with the rest of the mains, resulting in a tidy and uniformly laid out main strings across the frame. 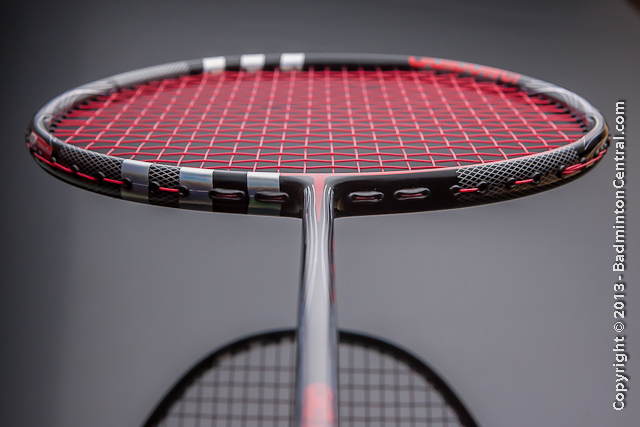 As with any modern rackets, single and double pass grommets are used in the appropriate locations to maximize frame strength. The adizero pro has a black base color scheme with yellow dominating accents. The model name “adizero pro” is found at the bottom of the shaft near the cone, and the Adidas signature triband at the racket head which forms part of the asymmetric design of the head. The Adidas logo is only subtly found on the cone and the handle base. The overall design with bold accents and simple line is a nice departure from the complex design of Yonex/Victor. I strung the adizero pro with Ashaway Zymax 65 at a tension of 22x22lbs. I chose a lower tension to match the light weight racket design and the medium stiff racket shaft. And it turned out it was a good decision. Note the use of the yellow ZM65 which matches the yellow accent of the adizero pro perfectly. On dry swings, the adizero pro feels light as it is designed to be. To be very honest I am not a big fan of light weight rackets as it is very hard to execute a power smash with so little weight on the racket. The only way to have it working is to give it a head heavier balance and a not-so-stiff shaft which is exactly what Adidas has done. Soon I will find out if it works out as intended to. I started off doing some drive defense drill against a very fast and trick player at the net. The adizero pro really surprised me, not only from its light and fast swing which is expected, but from the stability of the racket head which is something i don’t expect. Little deflection was felt on the racket head and the medium stiff shaft together means that the racket is fairly stable and easy to control. The quickness of the racket also means it is easy to contort the arm, wrist and fingers to returns drives aimed at the trickier contact points. Maneuverability is excellent. Moving onto the heavier shots, clears are not a problem at all. The medium stiff shaft is quite suitable for medium strength shots and while the head balance is slightly light, it doesn’t make it much harder to hit. It is not effortless, however, as one would need to give a little more emphasis on the wrist and fingers to send the shuttle over the other end of the court. For a 80 grams racket (my sample came in at 82g) the racket feel relative solid, not solid like the adipower pro but much more solid than other 82g rackets that i have tried. The overall racket feels lively when paired with medium feeling Ashaway ZM65@22lbs. I’d attribute that to the shaft design as well as quality raw material used. Most people won’t consider lightweight racket to be powerful. But this is where the adizero pro really surprised me. A couple of times when launching myself into a full on jumping smash, i was (pleasantly) surprised by the loud boom and velocity the racket managed to unleash. In fact, it got to the point that it was actually fun to hit smash with it. Despite head heavy balance this is afterall a light racket. While i find it very maneuverable at the net, esp for fast tricky shots like a cross court net, the stability cannot compared to heavier rackets. Having said that, I don’t have much problem executing netshots with it. I am still on the fence when it comes to defense with the adizero pro. I was able to do some super fast defensive drive and counterattack with the adizero pro, esp against the hardest smashing players who sometimes got left standing with the shuttle driven fast and deep into the opposite side of their court. However, I also find that it took extra effort to defend the shuttle deep and high into the backcourt, I have to consciously apply extra finger force to get the deep returns. The place where this racket shines the most is the mid court fast attacking drives, which is the bread and butter of this attacking light weight racket. It is so easy to counterattack fast incoming drives with a faster return. The response of the racket also seems to be tuned to this type of shots and speed. If this is your style, the adizero pro is the racket for you. No racket are perfect and neither is the adizero pro. While i don’t find the damping particularly much, but i do prefer less damped feel of the heavier brother adipower pro. The is a certain lack of crispness in comparison. I cannot exactly pinpoint the reason from my feel alone but i am guess either the shaft design or the lesser quantity of material used. To summarize, the adizero pro is a light swingweight racket that is excellent for players who prefers to play a fast attacking game esp in doubles. The head heavy balance combined with light weight and medium stiff shaft creates a synergetic combination which is both fast and powerful. I was pleasantly surprised by the racket despite my preference for heavier 3U rackets. 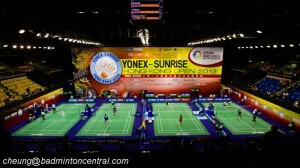 It shows that a good design can overcome power issues associated with light weight racket. As the flagship of the Adidas fast and light adizero series, this complements the comprehensive lineup that Adidas is offering badminton players very well.